The journey through the first week of She Hacks Africa Cohort 9 has been both an amazing and an eye-opening experience. Activities for the Cohort kicked off on Monday 5th of November, we got acquainted through an icebreaker, with each other and with our facilitators, Mrs Funke, Mrs Tolu and Mr Bolu. Lessons started in earnest as Ms Funke took us on the internet and how it works and afterwards, Bolu introduced us to HTML basics which included its; editors, attributes, tags, hyperlink and how to insert images, videos and audios on a web page. On the second day, we were introduced to table tags which allows us to insert tables on web pages. 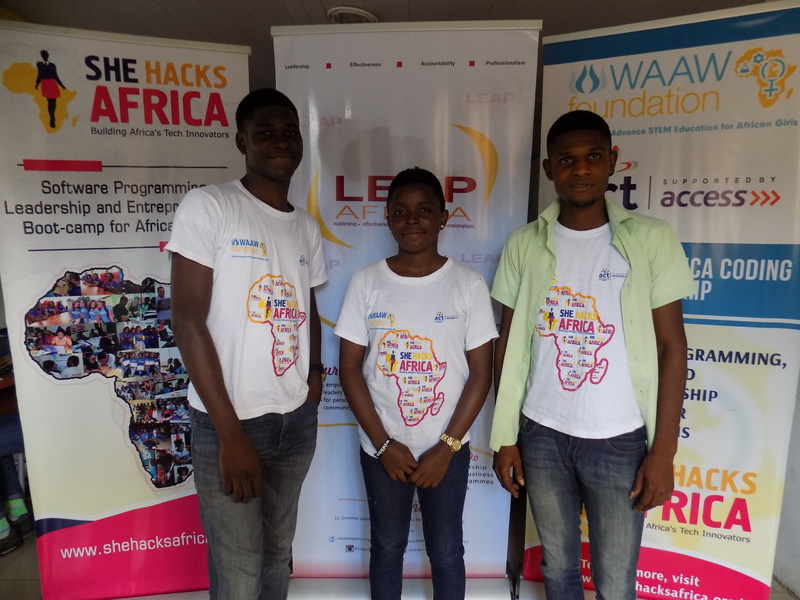 The day got more interesting as three resource persons from Leap Africa took us on entrepreneurship, design thinking, implementation of business model canvas and, the art and act of leadership. The classes ended with Mr Bolu taking us on block level elements. The third day started with a continuation of the block elements by Mr Bolu. Mrs Tolu came up to take us deeper into design thinking with steps to making a good website. The class took an interesting turn when we were challenged as a group to pick out a problem in Nigeria and work together to create a solution using all that we’ll be taught through out the period of the cohort. We chose to work on poor delivery services. It was presented and feedbacks were gotten for further refining. The day’s classes ended with an introduction to CSS by Mr Bolu. On the fourth day, CSS continued with Mr Bolu as he took us on styling and insertion of CSS into HTML. The group project winners from Cohort 8(Team Grace) came around to share their experiences during their cohort and some tips with us. The day was wrapped up with Mrs Tolu taking us on social entrepreneurship, the elements and characteristics of a social entrepreneur. Finally, on the last day of the first week which is Friday, Mr Bolu took us further in CSS styling. After which a former WAAW foundation member In person of Mrs Arefo Isabu of Aref’s Cuisine shared with us successful business tips using her business as a case study. And the last activity for the week was the presentation of prototypes for our group projects. After proper scrutinization and drilling from the panel. Group 3 won the presentation. Everyone were advised to work further on their projects and try to do a great job. In conclusion, it can be said that the our mindsets are changing to achieve one of S(He) hacks goal, which is to build innovators.